Click here for Shelly's website. Click here for Northern Hills Deed Restrictions. Click here for Ray's website. To get on our confidential neighborhood list for important notices: email the northern hills "webmaster at mynhha.org"
Please contact your Area Representative so that you can have one delivered to you. Thanks to NHHA President Ray Blankenberg for handling a very important meeting for all of us last night. If you weren’t there, you missed an excellent briefing and question and answer session on the City’s Animal Care Services presented by Joel Skidmore. We were also briefed on the upcoming Northern Hills Christmas Dinner on December 3rd and the Second Annual NH Christmas Market on December 15th. Councilman Clayton Perry gave us a good rundown on the many improvements being made to our infrastructure in District 10 and Northern Hills. Participants at last night’s meeting had the opportunity to vote for our 2019/20 NHHA Board of Directors. Clare Coleman, Jan Hadley and Kathy Green did an excellent job of organizing and running the election. We also appreciate that MJ Barnes and Donna Gobert took the time to design and get the ballots printed for us. I personally want to thank all those who volunteered to run for these board positions and congratulate those selected. Their service begins Jan 1. Besides myself as President, the new board includes Jean Stephens as Vice President, MJ Barnes as Recording Secretary, Karl Millard as Treasurer and Marianne Shields as Membership Secretary. All of us need to express our deep appreciation for the service of former board members President Ray Blankenberg and Membership Secretary Gail Millard (including her fabulous cookies). Thank you very much! As your new President I will work with our Board of Directors and residents to continue to preserve and protect Northern Hills and to encourage more residents to join our great Association. For non-emergencies, please call the department's non-emergency line. Please report suspicious activity here. Please send your email address or cell number to our webmaster so you can receive notices of any information of value to you as a resident of Northern Hills. We appreciate our members, volunteers, sponsors and supporters. Report anything suspicious to 207-SAPD. We encourage video surveillance. Please join our C.O.P. program. Dog walkers are especially encouraged to attend the COP class to learn what to report to police. Thanks to all of you that stay active in supporting our community. You can count on us at NHHA. Can we count on you to do your part with your annual dues. Since ALL RESIDENTS receive the benefits of the Northern Hills Neighborhood Association; We ALL need to mail our $48.00 annual membership payment to PO Box 34792, San Antonio, TX 78265-4792. For more information about membership, contact Marianne Shields. Her email address is "marianneshields@yahoo.com". Thank you very much! CITIZENS ON PATROL - C.O.P. - Northern Hills Neighbors - Call for volunteers! Get involved in neighbors looking out for neighbors. Volunteers are trained by SAPD to recognize and report suspicious activity. If you live in Northern Hills, then you know what a great neighborhood we have; please consider helping to keep it that way by joining our fabulous Citizens on Patrol (C.O.P.) program. We especially need folks to patrol weekend nights. To become a member of C.O.P. just attend a one time, no cost training class at the SAPD substation at 13030 Jones-Maltsberger, see schedule below. This is the 21st year of our C.O.P. program, please join and help us to continue keeping our neighborhood safe. Upcoming C.O.P. classes are listed on the home page - "Calender of Events". Our COP Manager is Ron Anderson, You can reach him at 210-651-2134	or email to "satxron@att.net"
Please call or email with name and phone number to get more information or confirm attendance. Northeast Substation Citizens on Patrol classes are a one-time four hour class. Please bring a photo ID when attending. All necessary applications will be filled out at the beginning of each class and photos will be taken for a complimentary C.O.P. ID card. Northeast substation Citizens on Patrol classes are 1-time, 4-hr classes. Please bring a photo ID when attending. All necessary applications will be filled out at the beginning of each class and photos will be taken for a complimentary COP ID card. For any questions, please contact Officer Dave McDonald at 210-207-6086. Please call or email with name and phone # to confirm attendance. Made up of leaders from nearby District 10 neighborhoods. We hope to see you all at our District 10 Community Meetings at the Tool Yard. 10303 Tool Yard, located on the south side of Wurzbach Pkwy between Perrin Beitel & Thousand Oaks. All are welcome at the DISTRICT 10 COMMUNITY MEETINGS at the Tool Yard. Here is your chance to learn about the latest issues affecting your neighborhood. Get the latest news from our District 10 City Councilman. Hear updates on the progress of San Antonio City Council. Hear about the neighborhood association's plans for programs and projects for the future. Please attend and bring your neighbor with you for these important meetings. Thanks to all of you who turned out for the Northeast Neighborhood Alliance meeting on Monday night. I was very impressed with how many of you were able to attend, considering that it’s Thanksgiving week and the weather was not that comfortable. We learned a lot from General Russ Handy about the plans for the future of the San Antonio International Airport and what effects those changes will have on our neighborhoods. Likewise, the briefings on the Alamo Area Council Of Governments (AACOG) by Tim Trevino and the San Antonio Housing Authority (SAHA) by Kristin Graudons gave us valuable insight into their various programs and initiatives. All the speakers, including our own District 10 Councilman Clayton Perry, invited us to call their offices if we have additional questions and issues they need to address. I would also like to thank all those hard working members of the NNA who helped set up and host this important meeting. Please mark your 2019 calendars for our next Alliance meeting on Monday, January 28th, 7 p.m. at the Northeast Service Center (10303 Tool Yard), and don’t miss next month’s District 10 Christmas holiday party on Monday, December 17th at 6 p.m. Councilman Perry reminded us all to bring along an unwrapped toy for donation to children in our area along with a dessert potluck for those attending the party. Happy Thanksgiving to all of you and please remember to share the information you collected on Monday with your neighbors. Help reduce strangers in our neighborhood and reduce the handbills and flyers on your doorstep. Place a "NO SOLICITING" sign on your door. Please contact your SAFFE officer if you receive solicitations or phone 311. Call 311 if you see "bandit" signs displayed in Northern Hills. Click here for the updated flyer on handbills. Logistix has opened a one stop recycling center, where you'll be able to drop off things the city won't take at the curb. Their paper shredders actually grind the paper instead of slicing it into strips. This is more secure and they then turn it into tissue paper. Logistix accepts the electronics, recyclables and paper for shredding from the public free of charge, and in some cases pay for it. They will have a drop off area for the public to come and drop off their items. The Logistix Recycling center opened in November. You can find it at 1949 Hormel Drive. If you have any questions, call them at 210.732.5246 or check www.logistixrecyclinghq.com. HELP WITH RECYCLING - Remember to "Bag in Brown, Recycle in Blue, It's Easy to do." Avoid placing diapers and other garbage in the blue recycle container. Fines are being assessed thru random curb checks. Yes to steel and aluminum cans but not steel coat hangers, batteries, electronic gadgets or paint in cans. Yes to glass bottles and jars, but not to plastic shopping bags from grocery stores (return bags to store). Brush-only pickup in our area is February and August. DO NOT place bulky items in your brush pile. Curbside pickup of Bulky items-only is approximately every six months. Example of bulky items: Furniture, mattresses, appliances, barbeque grills, water heaters, fencing, passenger car tires (limit 6) and small pieces of carpeting. The maximum is 8 cubic yards. Construction materials are not accepted. No brush is allowed during this collection. Do not place in front of parked cars or other obstructions. WARNING: DO NOT place brush materials out for collection unless you have received a notice from the City notifying you that brush collection will be provided in your area. Remember that you can take your brush, bulky items, and hazardous materials to specific locations at specific times. See the website links above. Please send webmaster your current email address to receive important neighborhood notices and invitations. Do you have a business? Tell your neighbors about it. List it here today! 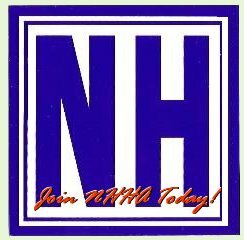 Get Free "NH" Window Sticker(s) for your vehicles and help police improve neighborhood security. Please volunteer for Cellular on Patrol (C.O.P.) - Contact Ron Anderson at 210-651-2134 or email "satxron@att.net""
Report suspicious persons and vehicles. That provides police a way to ask for identification. The membership form is available here or Contact Marianneshields@yahoo.com. If you know of anyone who might like to join us, please let me know so they can get an email invitation for the next Monday venue. 410 DINER on Broadway south of Loop 410 - Very similar to Checkers. EDDIE'S TACO HOUSE on Thousand Oaks just west of Wetmore - Great frozen margaritas! GRADY's BBQ on Wetmore Rd just past Thousand Oaks - .99 Margaritas! LONGHORN CAFE behind Walmart on Thousand Oaks the same side as Nacogdoches - Affordable, great food and service. POMPEII ITALIAN RESTAURANT on Nacogdoches past Judson Rd on left going out. Excellent food and service! TIU STEPPIS is is on Bulverde next to LA Fitness. Italian food and happy hour beverages. Please give me some feedback that can help with future events. If anyone knows of someone who would like to be an area representative - please contact me! We are hopeful that this free advertising will encourage these restaurants to support our association by purchasing advertising in our newsletter and website. Please support our sponsors marked with a * They support us with their advertising resources. Please share your recent dining experiences with the webmaster. We invite restaurants to support NHHA thru advertising. Northern Hills life just keeps getting better and better. All homeowners and residents are warmly encouraged to join the NHHA. We think we are the largest and strongest neighborhood association in San Antonio. Our boundaries are Thousand Oaks, Scarsdale, Stahl Road, Higgins Road, and Uhr lane. Marianne Shields is our Membership Secretary. Contact her by email at "marianneshields@yahoo.com"
Northern Hills Homeowners Association has been cited countless times by San Antonio city and county leaders as an example of what a neighborhood association should be, and we are very proud to be acknowledged in this way. As membership increases, we all benefit by remaining a strong active and exemplary neighborhood. All homeowners and tenants are encouraged to join and support the activities of the NHHA. A Recognized Citizens On Patrol (COPS) program keeping our neighborhood safer. As a resident/association member, your high school senior is eligible to apply for a $1000 scholarship. A quarterly newsletter full of Neighborhood news. Beautification & maintenance of all NH entrances. Sponsorship of semi-annual garage sales and neighborhood clean-ups. Sponsorship of National Night Out. Representation at City Hall meetings. Whether you are a home owner or tenant, your membership is appreciated! Let us join together to keep Northern Hills safe, our property values up and continue to be a great place to live. Sign Up Today!!! Only $48.00 per year!! Add your support to the growing Northern Hills Homeowners Assn. Are you new to Northern Hills? If you have recently become a resident of Northern Hills and would like a welcome packet, please call Jan Kirby at 656-5256. ARE YOU A MEMBER OF NHHA? Please join the Northern Hills Homeowners Association. You are already receiving the benefits. Please Join and Volunteer today! We would love to have you join our friendly and valuable group. After completing the membership information, to volunteer simply choose your area of interest at the lower portion of the application. Volunteer to help welcoming new residents and keeping neighbors informed of important information in your area. Call Jan Kirby, 656-5256. We need your stories, pictures and ideas for the mynhha.org website which is your website! It is the only website support by and endorsed by the NHHA. Share your good news with your neighbors; send an email (preferably in MS Word Document 97/2003 format) as you want it to appear; to the webmaster. This web site started as a means for opposing the SA Airport's FAR 150 update proposal that suggested that heavy air traffic be re-directed 15 degrees to fly "over the Cement Plant". The only problem with that solution is that WE are on the Other side of that Cement Plant. Although the FAA rejected that plan in 2001, in March of 2004 the Northern Hills Homeowner's Association has learned that the Environmental Impact Study (EIS) proposed the Airport still include the 15 degree turn. In February of 2005, we were notified that were successful getting the 15 degree turn removed from the EIS. All residents are strongly encouraged to join NHHA.